Olivia is one of those bloggers who hooks her readers in and uses a clever mix of gorgeous photography, great style and consistently great content to keep them reading. When I first stumbled across her blog (before I had even started my own!) I read all of her posts in one sitting. Crazy? Quite possibly, but Olivia's blog remains a firm favourite of mine and TONS of other girls. 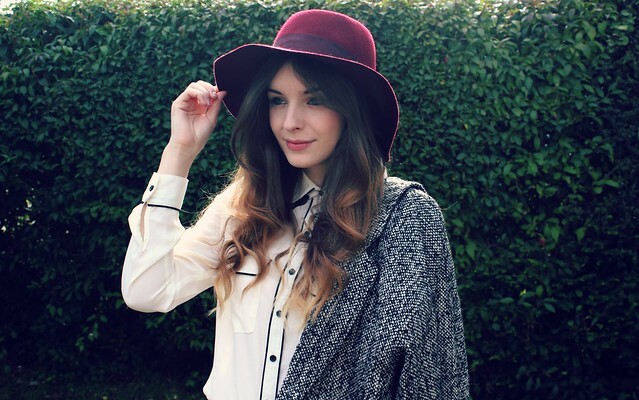 Not only is she fashionable and talented, shes also one of the loveliest bloggers around. Shes helped me out endlessly by helping to kick start mine and my boyfriends joint blog when she retweeted the link, she always answers my questions regarding blogging, uni and Brighton. I'm so glad I found her blog. So, I had a few things I wanted to ask the fabulous lady and I thought you guys might like to read her answers! So thank you, Liv, for letting me interview you for The Camera's Lying! Hey Olivia! What inspired you to start your blog? Hello! It was a mixture of reading a lot of other fashion blogs, and being an avid music fan. My blog initially began as a music blog and after discovering some incredible fashion blogs decided to take my own in that direction- and hey, here we are! To date, whats your favourite post on your blog? Ooh goodness, I don't think I could say! I try to make sure every post I publish is up to my best standard and something I'd be totally proud of; however saying that I always favour my interview posts as I always admire the people I talk to and know the work that goes into making them interesting. I'd probably say it's a funny mix of girlie girl-meets tomboy with a hint of 60's nostalgia thrown in for good measure. Favourite outfit you've worn recently? Ooh probably my Olive tweed skater skirt and navy jumper! It's something I always feel so comfortable and happy in; and will always run to it when I can't find anything else I want to wear. I love matchy prints, the colour 'oxblood' (or dark red!) and chunky knitwear- but I suppose that's always a winter trend! Whats your biggest blog related achievement to date? Oh goodness, probably coming away with Best New Fashion Blog at the Cosmo awards 2011! It still to this day stuns me. Saying that, I've been asked to give a talk at Cambridge this week about blogging which is pretty much beyond my wildest dreams! Hopefully a grown up job in writing/styling and maintaining to write my little blog! Can you see yourself blogging for a long time? Definitely! I like to think I still post because I enjoy it and not because it's a chore, and as long as I still do it with the passion I began it with than I'd like to think so! Just do it! (and do it because you love it)! People are so hesitant about beginning blogs, but I find if you just go out there and write and photograph at your very best then eventually you'll build up something you love. Are there any posts on your blog which now make you cringe? Not long left to enter my giveaway, where you could win your own MAC lipstick! Enter here!